The Sunshine Coast Trail is a 180-kilometre trail that stretches from Sarah Point in Desolation Sound to Saltery Bay. The Sunshine Coast Trail traverses a wide variety of landscapes, from coastal shorelines, along creeks and lakes, through old growth forests to panoramic mountaintops. It provides hikers with the opportunity to experience Powell River’s breathtaking backcountry with its rich fauna and flora. Manzanita Hut is located on Manzanita Bluffs on the Gwendoline Hills trail section. 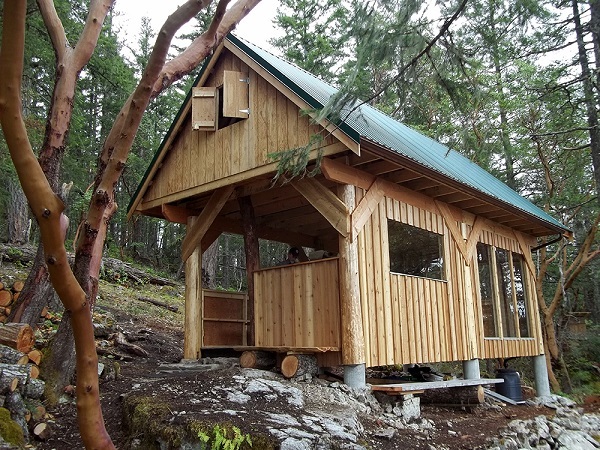 This is the first hut along the Sunshine Coast Trail encountered from the start in Desolation Sound, with panoramic views of the Copeland Islands, Savary Island, and the Salish Sea. It is surrounded by manzanita bushes, arbutus trees, and old-growth Douglas fir trees. It is also a great place to spot eagles soaring in the air. One-and-a-half to two hours from either end of Gwendoline Hills Trail, it makes a great lunchtime destination for day hikers. (5.3 km one way, with a moderate difficulty level). Just a few minutes setting off Malaspina Road, expect to enter a grove of old growth Douglas Fir, mossy forest floors and easy going terrain. It’s worthwhile to take your time here; admire the trees and see if you can spot some hidden birdhouses. You’ll soon find yourself at a rocky ledge where a logbook, bench, and views of the Salish Sea and second growth forest await. Continuing north, a length of second growth forms a tunnel that ends at the Pryor Road access trail. The route rises at this point and you’ll eventually find Emil’s Bench – you may want to hug an old growth tree at this point in his honour. The trail continues its ascent through Gwendoline Hills until you reach a logging site. Don’t miss the orange diamond on the right as the trail opens up. The route drops down to muddy Gwendoline Creek, which you’ll follow before heading up the most challenging section of the trail. The mixed arbutus and old growth forest will soon clear up and you will see the Hut right away. There are stunning views of the Salish Sea and nearby islands, particularly Savary – and you can even catch a glimpse of Okeover Inlet. It is worthwhile to sign the logbook inside the hut and read other entries. The hike is definitely easier on the way back. Also, don’t forget to pick up your Sunshine Coast Trail passport – where you can collect unique stamps for each hut you visit. The Lund Hotel is the holder of the unique Manzanita Bluff Hut stamp. A gravel road branches to the left; park here and look for the trail head. You can’t miss it.